Camera: Nikon D3X, ISO 100, 1/125, f11, 4550 k, Manual Mode, 24-70mm 2.8. Key Light: One Sunpak auto511 set to full power inside the FourSquare softbox. Background Light: One Lumedyne head with a standard reflector set to wide at 100 w/s. I have been testing a variety of old school flashes to ensure their compatibility with the FourSqaure. 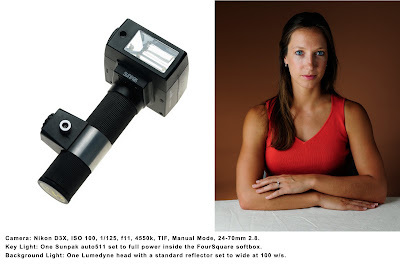 The FourSquare is a truly a versatile tool that can be used with just about any hot shoe flash.